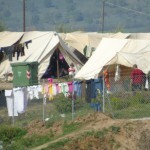 At Cherso we were told that about 2500 people are currently living in the camp. 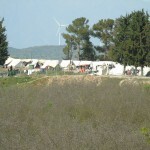 A few weeks ago, there were 1000 more, when the camp was full of mud, due to heavy rain. There are only 5 showers and 10 toilets available in the camp. New shower containers are already in the camp but not connected yet. Baby milk and pampers are rarely available. Like in Nea Kavala, the camp residents get noodles nearly every day, delivered by a caterer from Thessaloniki. In front of the camp is a snack car, where people who have money can buy snacks and drinks. 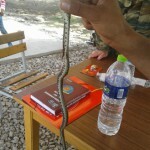 The camp is located in the „middle of nowhere“ and people told us, that snakes and scorpions are being seen permanently. 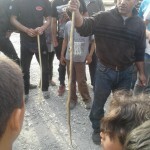 Photos were presented to us, showing snakes which were killed by the residents of the camp. People are very afraid. A man whom we talked to said that he already caught a snake inside his tent. 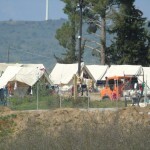 Only basic medical treatment is available in the camp. 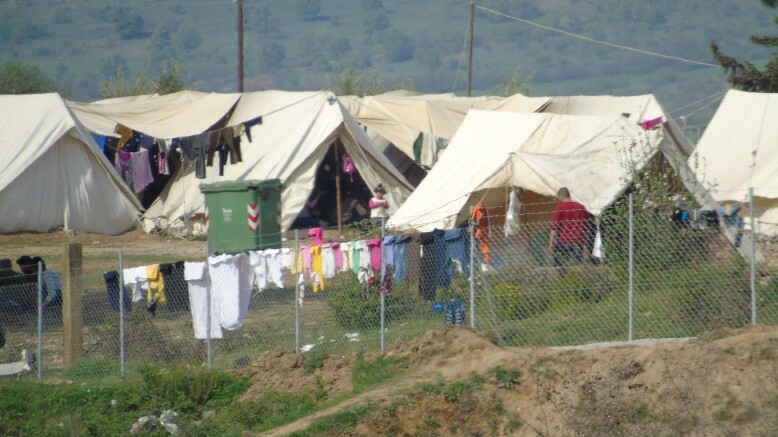 We were informed about a man, who has serious problems with his kidneys and has to go to blood purification more times a week – anyway he lives (or better: lies) in the camp far away from the next hospital.